More promotional material for the apparent next Call of Duty, subtitled “Infinite”, has been revealed, ramping up hype around the heavily-rumoured Modern Warfare Remastered. A leaked promotional poster sent the internet into over-drive last week when it teased Call of Duty 4 Modern Warfare Remastered. The only problem was that the poster was grainy, tilted, and cut-off in a questionable manner. Now some new promotional material seemingly for Canadian retailers has been leaked, stating a November 4 2016 release date. 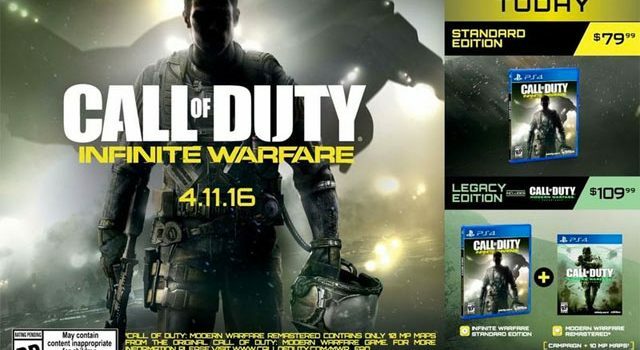 It also confirms a “Legacy Edition” of Infinite, which will feature Call of Duty: Modern Warfare Remastered. That remastered game will reportedly feature 10 maps from the original classic shooter, as well as the full campaign. The Legacy Edition is priced at C$79.99, which is about A$83. That’s far too cheap for that sort of game package: expect it to be A$110-plus. This leaked promotional poster first appeared on Reddit, and is certainly more reliable than the original leak from last week. Interestingly, if this leak is to be believed, it seems as though Activision will be splitting the Call of Duty 4 map packs into groups, with 10 available at launch, while the other 10 maps — there were 20 in total in the original game, four which were DLC — released as paid DLC. Seems pretty standard for an Activision game. Infinity Ward, who developed the original Modern Warfare as well as its two sequels, hasn’t released a game since 2013’s under-performing Ghosts. The studio will definitely be looking to reestablish itself as the “Kings Of COD” with both Infinite and Modern Warfare Remastered. The studio certainly isn’t shying away from all the hype, either. Just get a load of this Modern Warfare 2 reference, directed at a fan questioning the validity of the leaks.